With the ever-changing economy, so many people have begun investing in gold, especially physical gold, like gold bullion. This is because while stock market prices may crash, gold remains a reliable option for you to rely on in case of an emergency. However with physical gold, there is a greater chance of meeting scam artists so follow these tips when buying gold bullion to avoid being ripped off. Make sure that the seller isn’t trying to sell you a counterfeit coin. Ask that the coin be weighed in front of you. Fake coins weigh less than genuine ones because they’re comprised of mainly iron or copper. Perform a few other tests to check for authenticity, such as the magnet test, where you place a small magnet above the bullion you’re interested in. If they attract to each other, you’ll know it’s a fake. You can also try gently tapping the bullion with a non-abrasive metal and if it chimes or pings, it’s genuine bullion. However, if it makes a clunky noise, it’s a fake. Know what kind of coin you’re buying so you can spot a bait and switch. Bullion coins are worth purely their melt value, while historical coins are measured both by their melt value and how collectible they are. Know the formula to figure out the current premium and spot price. The formula to calculate the premium includes subtracting the spot price from the quoted price and dividing it by the spot price. After that, multiply that number by 100 and you’ll have your premium percentage. Aim to buy gold bullion no more than five to 10 percent over the current spot price. The spot price changes to make sure you know what it is currently. Buy your gold from a reputable gold dealer and only buy genuine Australian Gold bullion. Aim to find a site that carries genuine Swiss gold bullion, as well as newly popular silver and platinum bullion. 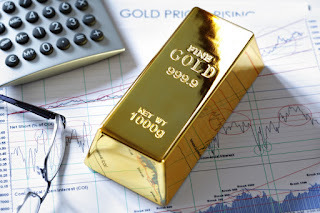 Look for a company that lists up-to-date prices on their website and has local offices and investment professionals to assist you, as well as an accessible website if you choose to buy gold bullion online. Check if they include a buy back policy, if for any reason you’re not satisfied. Most reliable ones do. Research current prices often. This protects you because you’ll be well-informed when shopping around, but you’ll also know current trends in case you do ever run into a financial emergency. Avoid making stupid mistakes and instead make smart choices, like putting your bullion in a private depositary or even a locked safe at home. Many banks or dealers offer you unallocated storage, but you could get screwed with bank fees, or even extra insurance fees if something happens to the bank. In addition, sometimes offers of “free storage” can be misleading so you’re better looking for storage on your own. You shouldn’t be scammed and feel overwhelmed just because you decided to invest in gold bullion. As long as you stay aware of the current trends, daily rates, and where you can purchase some gold reliably, you should be able to invest in this latest craze too.